Looks like it might be a Minnesota 1912-13-14 plate. Too bad the numbers are not completely legible - I could tell you who owned the car and where that person lived. Nice action and vague enough to make you ponder what is going on. I first thought what must be an inner tube was an extra arm and a face below the middle fellows right arm. Another cool pic Jay. Looks like a '14? I think the lady in the dress is doing the tire pumping. Imagine chicks doing ANYTHING like that today...let alone wearing a DRESS!! There is another man just standing watching on the far right. I wonder why he doesn't help? Are we seeing faces again? The jacket on the person at the right is buttoned right-over-left, which suggests that it's a woman's jacket. And the buttons are decorative, not plain ones like a man's would be. The man is to the right side of the picture on the woman's left. You can only see half of him, but he is quite tall. He is wearing a black suit with black pants. He is looking down toward the workers as you can see his nose to the right of her head. It was the Butler in the library with the candlestick. 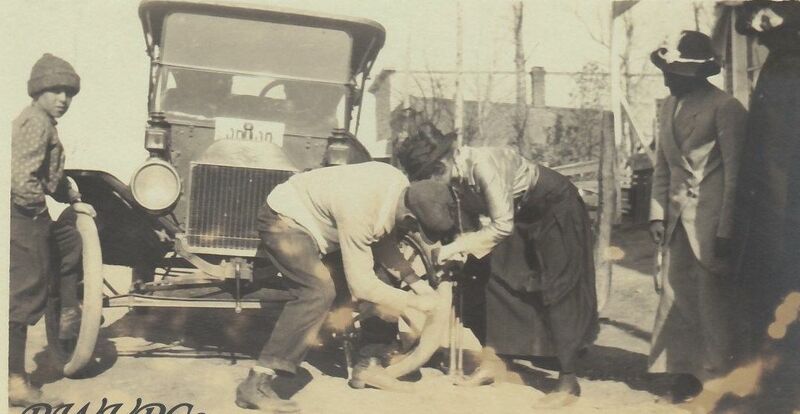 The woman is pushing on air pump and the guy is holding what looks to be a tube. But, you can see the driver side wheel has a tire on it. So....I suspect he peeled off the tube, applied a patch and so on.......Jerry. The guy on the right is the smartest one of all. He's standing there, hands in pockets whistling Dixie. My wife took this photo on a tour in 2010. when I saw the thread title I had to include this picture. 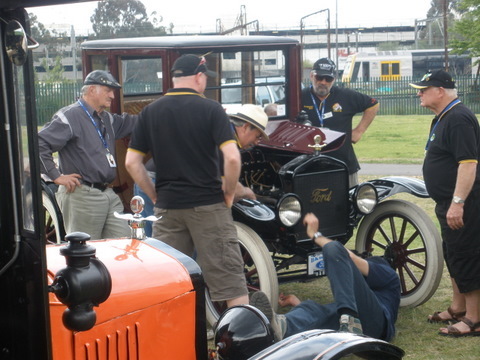 A crowd of guys to fix a faulty timer! It make me think about the city workers here, One is working five are looking and they get all paid at the end of the month.